This is a film about one of the main pilgrimage centres in Japan, Mount Koya, south of Osaka, which is home to the Shingon, or esoteric sect of Buddhism. Shingon is a Vajrayana sect in Japan, one of the few that survive there, and was brought to Japan from China by the monk Kukai, later known as Kobo-Daishi (the Grand Master). 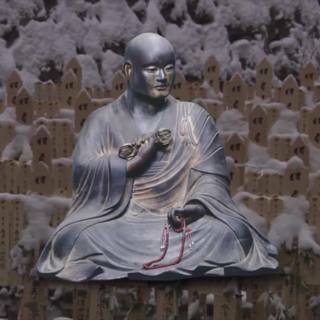 The film, which is hosted by Dr. Shingen Takagi, shows us not only the main pilgrimage centres and temples, but also gives an introduction to Shingon and its founder. The mountain was first settled in the early 9th century by Kukai, and by now hosts over 120 temples. We only see a selection of the most famous and important in the film of course. The film basically follows the pilgrimage trail from the gate leading on to the mountain, through some of the main temples, and on till the mausoleum of Kobo-Daishi. We see some of the wonderful statues, scrolls, and other artworks in the temples, and the distinctive architecture of the region also. What is the soundtrack used around 8:00 minutes in during the main temple sequence.